“Less management, more encouragement” is one of Chris Malham (left) and Rob Spoor’s mantras. Talk to Chris Malham and Rob Spoor, and you hear a lot of laughs and a lot of “dudes.” Despite insisting they haven’t rehearsed the interview, they finish each other’s sentences. They appear to genuinely appreciate and get a kick out of each other. Their compatibility as business partners is evident, which hints at why they have been able to grow SiteWorks, their Chandler, Ariz.-based landscape development and maintenance company, from nothing to $23.1 million in 14 years despite several significant setbacks. 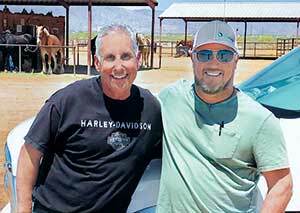 As the company gears up to renovate the field for the Arizona Cardinals—their first NFL endeavor—Malham and Spoor are quick to say they haven’t done it alone. Certainly, they would be nowhere without a loan just shy of a quarter million dollars from Don McIntyre, Malham’s first boss in the industry in 1975 and their silent business partner today. Their leadership team, including Scott Gibson, their general superintendent and Steve Hoover, a partner in their maintenance business, have been key components of the company’s success. The SiteWorks story starts in 1998 when Malham, a career landscape industry business developer, was teamed up with Spoor, an operations-minded project manager, at ValleyCrest Cos. in Phoenix. After a few years, Spoor left to join Landscapes Unlimited, but the pair kept in touch. The idea to “start their own thing” had come up before. One day in 2003 Malham was finally ready to make his move. With a company name in mind and financial backing from McIntyre, Malham called Spoor with an offer to join him in a new venture. On Dec. 1, 2004, they officially launched SiteWorks—a name inspired by animation studio DreamWorks—out of Malham’s post-divorce apartment. They mapped out their vision on a yellow-lined piece of paper that they still have today, which details their roles and the culture they intended to foster. As they anticipated, several of their former clients sought them out, and they began acting on their plan to take advantage of the Phoenix building boom. Before long, they landed their first contract—a $1.4 million deal with a general contractor. 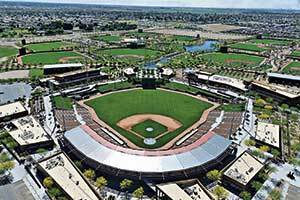 Sportsfield construction—which the pair had been involved with in their previous roles—came shortly after with a deal to renovate the San Francisco Giants spring training facility, owned by the city of Scottsdale. Less than a week later came SiteWorks’ first major setback—a cease-and-desist and lawsuit threat from a former employer and a rescinded offer from the city. According to Malham, his former employer alleged that he pursued the relationship with the Giants while still employed there. Malham says that was not the case. Malham and Spoor thought about folding, unsure if they could shoulder the legal fees. They regrouped, lawyered up and decided to swing back. Ultimately, SiteWorks had to rebid the contract against the competition. They won the bid the second time around and finished the job successfully, despite running into further challenges, like getting a bond without any real financials to show. After the unlikely feat of having the bond requirement waived by the general contractor, Malham and Spoor say they completed the job successfully, and this project legitimized their business. Overcoming obstacles like legal and bonding issues early on was tough, the partners say. They point to their team of outside consultants who have gotten them through difficult times. They use the acronym BABHI—banking, accounting, bonding, health and insurance (general liability) to represent key areas of their business where experts have helped them out. “We surrounded ourselves with a strong team of consultants that could give these hooligan landscapers guidance on the decisions we needed to make,” Malham says. The Great Recession, which hit many other industries in 2008, was another challenge for the young business, but it didn’t affect SiteWorks until a few years later. “By virtue of how the work happens, all the dirt guys and survey guys felt the pinch right away because no new projects were starting, but we had work in the mix,” Malham says. When it did hit, though, Malham and Spoor were fortunate to have operated conservatively with strong retained earnings—in the millions—up until that point. Though the company had to do layoffs, scale back and the owners went without salaries for two years, it was able to retain key staff during the downturn, which Malham and Spoor attribute their success to. In fact, employee retention is a big contributor to the company’s overall story, the partners say. “We have a couple of formulas we ascribe to and one is to assemble a compatible team, pay them extremely well and then get the hell out of their way,” Malham says. Spoor points to several foremen who worked on the company’s first job in 2005 who are still with them today. For example, when a new foreman comes onboard, he gets a brand new truck. “You don’t get a hand-me-down that’s got 127,000 miles on it because the guy that’s been here for five years needs a new truck,” Spoor says. Taking it a step further, SiteWorks always has allowed foremen to take home their vehicles for personal use, which required the company to buy a rider insurance policy. “Today, we still allow that usage, and it has never been abused,” Malham says. SiteWorks also shows its appreciation for its team with a performance-driven bonus program, which is based on the underrun of a completed job’s budget. Twenty-five percent of the underrun amount is split between the project manager, site superintendent, general superintendent and purchasing agent with a reserve for the field staff. The completed jobs are tallied twice a year, and the team often receives sizable bonuses. On the other hand, if an overrun occurs, the same 25 percent carries over against future bonuses. The company has had this program since its inception and honors it today, no matter how high underruns get. Looking back on the business they’ve built, which now includes SiteWorks Landscape Development, SiteWorks Landscape Maintenance, LandWorks—a dirt moving and light grading company—and their newest business, DroneWorks, the pair joke about what they set out to do. The No. 1 problem Rob Spoor sees in the landscape industry is a lack of understanding about job costs. Spoor says he often reminds his team that a company doing $20 million a year at 10 percent and a company doing $10 million a year at 20 percent both earn the same amount of profit at the end of the year.